If you had walked into the Pasir Ris Indoor Sports Hall unaware, you might have mistaken what was really going on for some manner of carnival games. 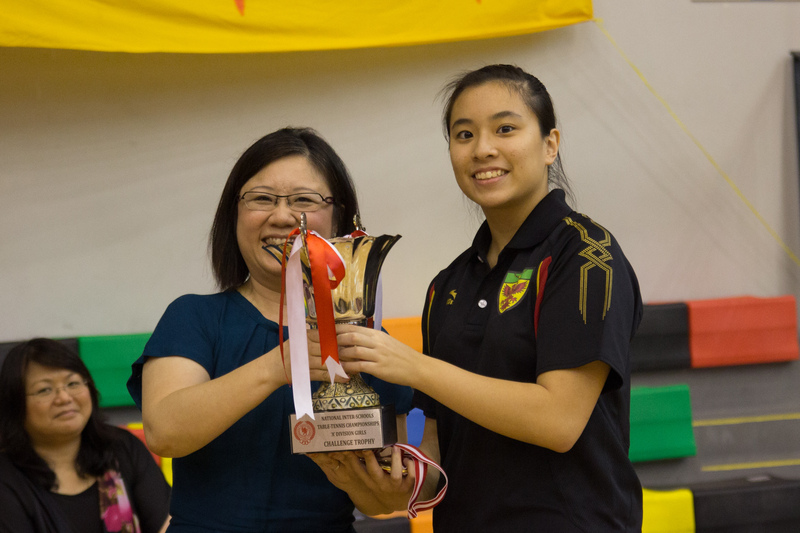 But rather than a dishonor to the sport, that assumption would be more of a testament to the supportive and hyped up atmosphere at the National Inter-school Table Tennis finals yesterday. 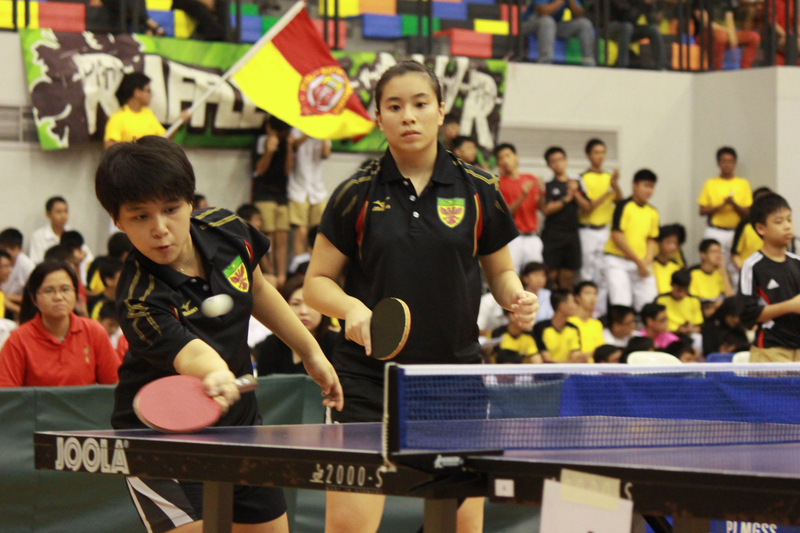 Our Raffles paddlers faced stiff competition from traditional rivals such as Hwa Chong Institution. In the three-hour slugfest, our paddlers took the challenge head-on and rallied themselves together to achieve the gold in both the ‘A’ division boys and girls categories. While the ‘A’ division girls team maintained a steady stream of victories at the beginning of the final, the intense atmosphere eventually got to our players during the fourth match of the ‘A’ division girls final. Having been bested by their Raffles opponents in the first two sets, the Hwa Chong duo took advantage of a series of unforced errors by our paddlers to take the third set 11-4. Should HCI have come back from behind to win the match, they would have claimed the title then. 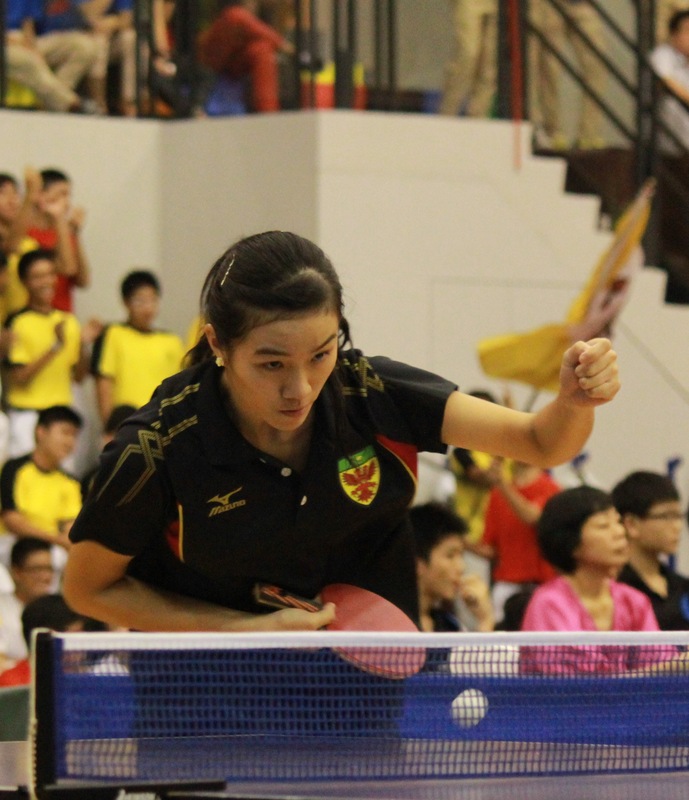 However, the Rafflesian duo of Wan Yu Quan and Xu Han Zhen came back from the time-out, invigorated, to win the match 3-1. The girls eventually edged out HCI 3-2 to win the championship. The ‘A’ division boys had it easier. Kerry Tan’s singles match ended quickly in sets of 11-6, 11-8 and 11-4. 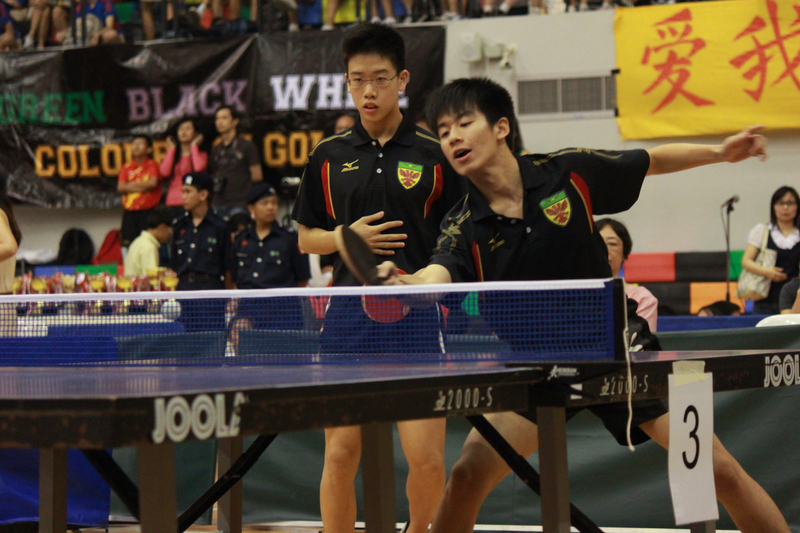 The duo of Julian Woo and Ansel Lee went toe-to-toe with their opponents before triumphing in the end, topping off the 3-0 defeat of HCI. Julian explained that the victory was especially sweet as Ansel and he had been doubles partners for the past six years, and this victory marked the conclusion of their successful partnership. In the second singles match, Bryan Teo put up a strong performance and beat his opponent convincingly. At one point he was leading 8-1. He said that, as captain of the team, he was elated as this was their final shot at the championship, and they managed to bring their years of training to fruition. What was heartwarming about the finals was the unmistakable team spirit and passion that showed through every member of the team. Mandy Wong said, “We wouldn’t have made it if the boys weren’t there to help us at every juncture of training.” Mr Ng praised the team for their ‘superior teamwork’, describing how everyone used to stay in school till 8 PM to practise. An external coach, who wishes to remain anonymous, said she was very impressed with RI’s team spirit. Of course, who is to forget the relentless efforts of our dear match supporters, student councillors and allocated classes alike? 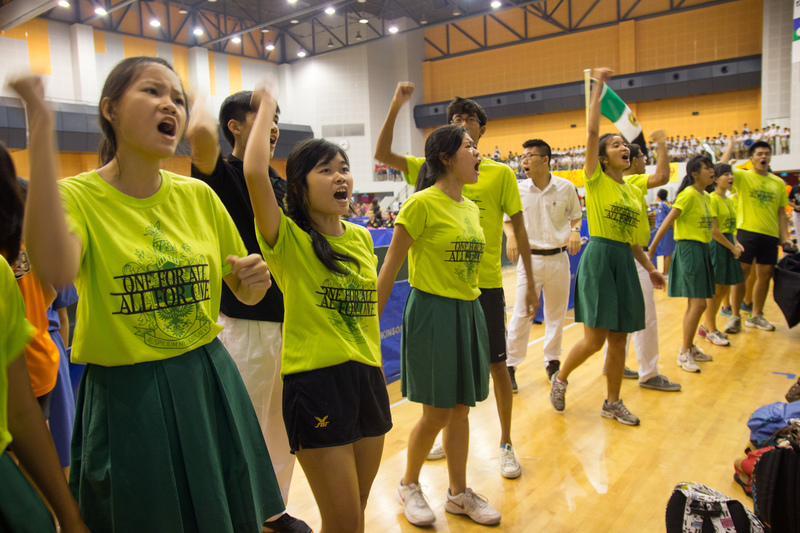 Year 6 councillor Daniel Tung noted, “The energy levels were very high and the cheering was electrifying. Every bit of cheering helps the players at every stage of the match.” While that may be true, HCI had equally if not more energetic supporters who, from time to time, drowned out the rest with their remarkable cheers. What was even more impressive were the louder and more spirited cheers by the students in red, brown and white despite their disadvantage in numbers. This is not to discount the concerted efforts of our Rafflesian supporters, but inter-school rivalry extends to match support too. 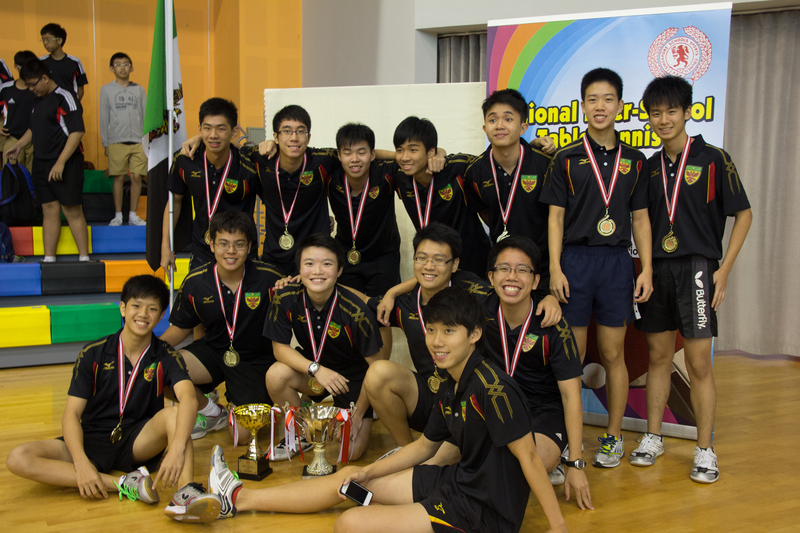 And while we took home the ‘A’ division titles this time, it was probably Hwa Chong who won in cheers and spirit. But if there was anything that distinguished this table tennis final from all others, it was really a string of superlatives that marked the event. Our ‘A’ division boys delivered the biggest and fastest defeat of their opponents in any of the finals, and our girls triumphed in one of the most unpredictable and back-and-forth matches ever, even though their third singles match was probably the most comfortable win of the day. In the Year 1-4 camp, the ‘B’ division boys shocked everyone with their explosive victory celebration when they trampled over the barriers to embrace the victorious last singles player. That being said, this was an all-Raffles affair, with the juniors from Raffles Institution Year 1-4 and Raffles Girls School doing the school proud as well. Team Raffles eventually captured five of the six team Gold trophies on offer, after being featured in all six finals. So yes, it was a case of ordered chaos, and some of us were disappointed, cheering could have been better too, but behind that was the silver lining of a Rafflesian victory, and ultimately it was Team Raffles who won the day.